Alice James Books, 9781882295982, 80pp. There is no place Matthew Olzmann doesn't visit in his poignant debut. From underwater to outer space, Mezzanines is a contained universe, constantly shifting through multiple perceptions of the surreal and the real. A lyrical conversation with mortality, Olzmann explores identity, faith, and our sense of place, with an acute awareness of our minute existence. How many shadows are there left to name? is the fear of falling man-made satellites. everywhere, bolts loosening, metal body in flames. the color of a baby's new blanket, cloaking everything. Matthew Olzmann is a graduate of the MFA program for writers at Warren Wilson College. His poems have appeared or are forthcoming in Kenyon Review, New England Review, Inch, Gulf Coast, Rattle, and elsewhere. He's received fellowships from Kundiman and the Kresge Arts Foundation. Currently, he is a writer-in-residence for the InsideOut Literary Arts Project and the poetry editor of The Collagist. 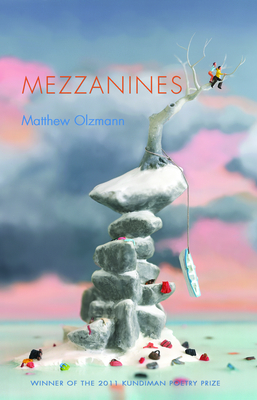 Author: Matthew Olzmann is a graduate of the MFA Program for Writers at Warren Wilson College. His poems have appeared or are forthcoming in Kenyon Review, New England Review, Inch, Gulf Coast, Rattle and elsewhere. He's received fellowships from Kundiman and the Kresge Arts Foundation. Currently, he is a writer-in-residence for the InsideOut Litereary Arts Project and the poetry editor of The Collagist.